campaigned as a populist champion for the auto industry on his way to winning Michigan’s primary last year, excoriating Senator John McCain for declaring on the stump that some of the industry’s lost jobs were not coming back. 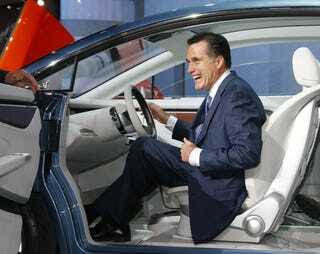 Romney proposed increased government spending for research on advanced fuels and vehicles, aid to automakers to deal with the costs of health care and pensions for retirees, and tax cuts for most taxpayers to help them buy new cars. [...] In Warren, McCain said he would be "ashamed" to tell voters that the lost jobs would return to Michigan, but he vowed to take care of displaced workers through a promised job retraining program that would be offered through community colleges.